The author has spent her career teaching people how to communicate for success. 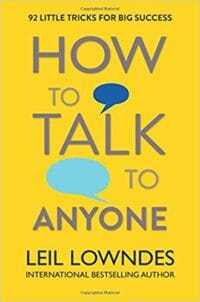 In her book How to Talk to Anyone (Contemporary Books, October 2003) Lowndes offers 92 easy and effective sure-fire success techniques-- she takes the reader from first meeting all the way up to sophisticated techniques used by the big winners in life. When meeting someone, imagine he or she is an old friend (an old customer, an old beloved, or someone else you had great affection for). How sad, the vicissitudes of life tore you two asunder. But, holy mackerel, now the party (the meeting, the convention) has reunited you with your long-lost old friend! The joyful experience starts a remarkable chain reaction in your body from the subconscious softening of your eyebrows to the positioning of your toes—and everything between. TECHNIQUE #7 LIMIT THE FIDGET Whenever your conversation really counts, let your nose itch, your ear tingle, or your foot prickle. Do not fidget, twitch, wiggle, squirm, or scratch. And above all, keep your paws away from your puss. Hand motions near your face and all fidgeting can give your listener the gut feeling you’re fibbing. TECHNIQUE #9 WATCH THE SCENE BEFORE YOU MAKE THE SCENE Rehearse being the Super Somebody you want to be ahead of time. SEE yourself walking around with Hang by Your Teeth posture, shaking hands, smiling the Flooding Smile, and making Sticky Eyes. HEAR yourself chatting comfortably with everyone. FEEL the pleasure of knowing you are in peak form and everyone is gravitating toward you. VISUALIZE yourself a Super Somebody. Then it all happens automatically. TECHNIQUE #10 MAKE A MOOD MATCH Before opening your mouth, take a “voice sample” of your listener to detect his or her state of mind. Take a “psychic photograph” of the expression to see if your listener looks buoyant, bored, or blitzed. If you ever want to bring people around to your thoughts, you must match their mood and voice tone, if only for a moment. TECHNIQUE #11 PROSAIC WITH PASSION Worried about your first words? Fear not, because 80 percent of your listener’s impression has nothing to do with your words anyway. Almost anything you say at first is fine. No matter how prosaic the text, an empathetic mood, a positive demeanor, and passionate delivery make you sound exciting. TECHNIQUE #12 ALWAYS WEAR A WHATZIT Whenever you go to a gathering, wear or carry something unusual to give people who find you the delightful stranger across the crowded room an excuse to approach. “Excuse me, I couldn’t help but notice your . . . what IS that? TECHNIQUE #13 WHOOZAT Whoozat is the most effective, least used (by non-politicians) meeting-people device ever contrived. Simply ask the party giver to make the introduction, or pump for a few facts that you can immediately turn into icebreakers. NEVER THE NAKED CITY Whenever someone asks you the inevitable, “And where are you from?” never, ever, unfairly challenge their powers of imagination with a one-word answer. Learn some engaging facts about your hometown that conversational partners can comment on. Then, when they say something clever in response to your bait, they think you’re a great conversationalist. TECHNIQUE #16 NEVER THE NAKED JOB When asked the inevitable “And what do you do,” you may think “I’m an economist/an educator/an engineer” is giving enough information to engender good conversation. However, to one who is not an economist, educator, or an engineer, you might as well be saying “I’m a paleontologist/psychoanalyst/pornographer.” Flesh it out. Throw out some delicious facts about your job for new acquaintances to munch on. Otherwise, they’ll soon excuse themselves, preferring the snacks back at the cheese tray. When talking with anyone, keep your ears open and, like a good detective, listen for clues. Be on the lookout for any unusual references: any anomaly, deviation, digression, or invocation of another place, time, person. Ask about it because it’s the clue to what your conversation partner would really enjoy discussing. TECHNIQUE #18 BE A WORD DETECTIVE Like a good gumshoe, listen to your conversation partner’s every word for clues to his or her preferred topic. The evidence is bound to slip out. Then spring on that subject like a sleuth on to a slip of the tongue. Like Sherlock Holmes, you have the clue to the subject that’s hot for the other person.